This water-based serum helps correct dull, blemished or uneven skin. The revolutionary antioxidant Vinanza Grape & Kiwi helps minimise the appearance of facial redness. Exfoliating enzymes from the superfruit kiwifruit and anti-inflammatory Vinanza Oxifend from pinot noir grapes leave skin gloriously glowing. Meanwhile, mamaku black fern and Reishi mushroom boost healthy cell renewal for true, fresh-faced beauty. Aqua (Waiwera® artesian) water, Aloe barbadensis (aloe vera juice) extract, Cyathea medullaris (mamaku black fern leaf) extract, gluconolactone, sodium benzoate, Amigel® (sclerotium gum), Vitis vinifera (Vinanza® Oxifend pinot noir grape) extract, caprylyl/capryl glucoside, dehydroacetic acid, benzyl alcohol, xanthan gum, Actinidia chinensis (Vinanza® Kiwi kiwifruit skin) extract, Rubus idaeus (raspberry seed) oil, Vitis vinifera and Actinidia chinensis (Vinanza® Grape & Kiwi grape seed and kiwifruit seed) extract, Gandoderma lucidum (Reishi mushroom) extract, sodium hydroxide, essential oil fragrances of green apple & cardamon: benzyl alcohol+, cinnamal+, citral+, citronellol+, geraniol+. + Component of essential oil, * Certified organic ingredient. 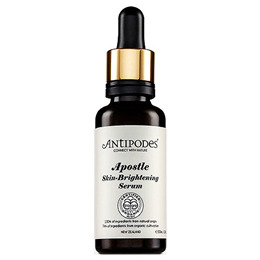 Apply liberally to face, neck and décolletage morning and night before your favourite Antipodes moisturiser or face oil. Get best performance from daily use. Below are reviews of Antipodes Organic Apostle Skin-Brightening Serum - 30ml by bodykind customers. If you have tried this product we'd love to hear what you think so please leave a review. This water-based serum helps correct dull, blemished or uneven skin. The revolutionary antioxidant Vinanza Grape & Kiwi helps minimise the appearance of facial redness.